Squint for Bolt, a sleek portable backup phone battery that’s roughly the size of your thumb (assuming you don’t have freakishly small or large thumbs), available now. When you’re thinking of things you’re thankful for after dinner tomorrow night, feel free to add “a phone that never dies” to the list. 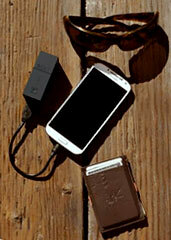 So, danke, ridiculously-small-2.75-inch-portable-charger-with-twice-the-battery-capacity-of-similar-but-larger-products. Then, when it’s time to head to a destination where outlets typically don’t exist—a plane, a tailgate, a hammock on an island off the coast of Spain—you’ll have this rubberized mini black box on hand to draw a charge from.